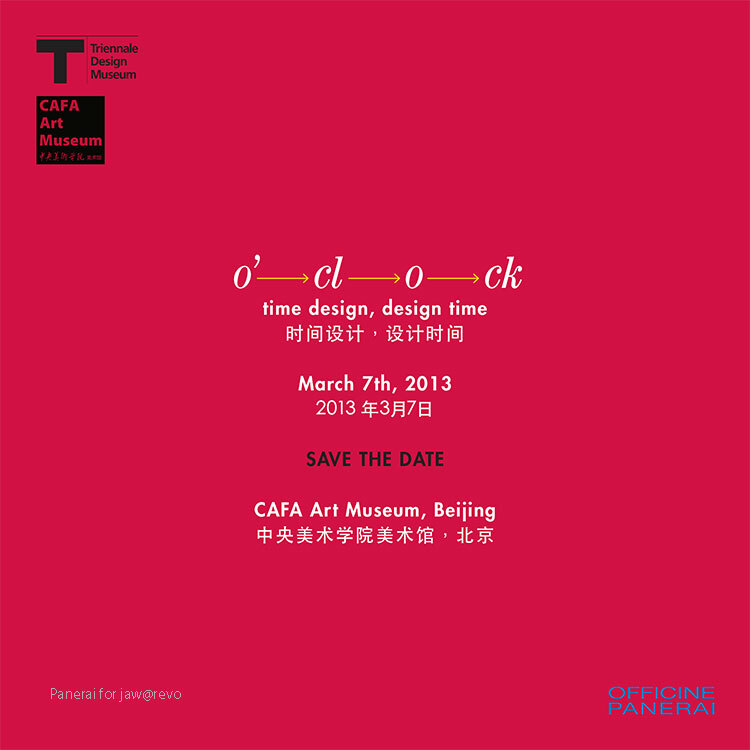 In Partnership with Officine Panerai, The Beijing "O’Clock – Time Design, Design Time" at Cafa Art Museum. 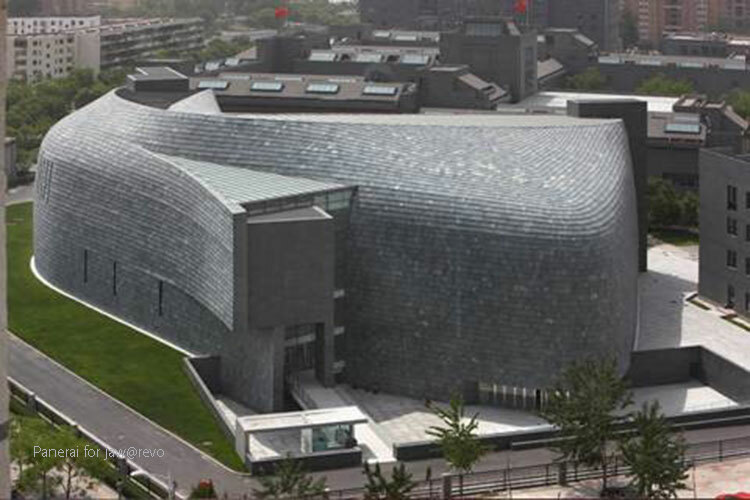 If you are around Beijing from today (7th March 2013) to 10th April 2013, do make a point to visit the Cafa Art Museum. 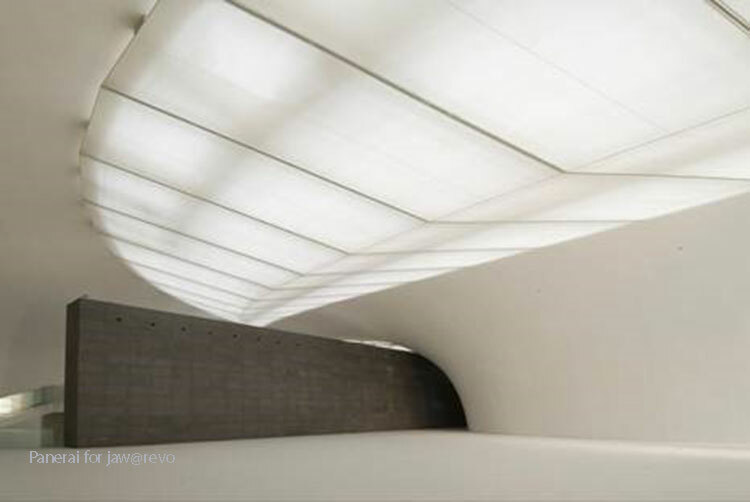 the Beijing Cafa Art Museum. 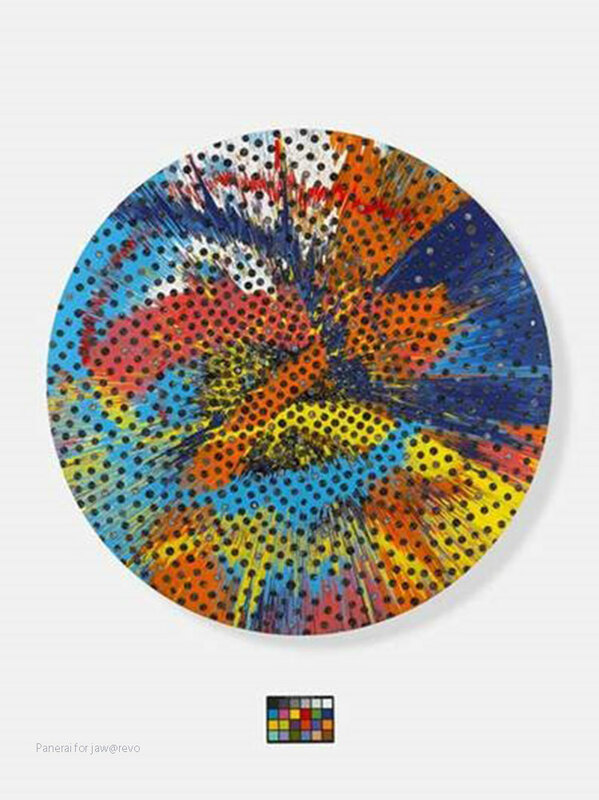 Presented by the Triennale Design Museum and in collaboration with the Italian Cultural Institute in Beijing, this exciting art exhibition is curated by Silvana Annicchiarico and Jan van Rossem. With Patricia Urquiola in charge of the exhibition arrangement and design and Panerai as the official partner, this is likely to be an eye opener for both art and watch enthusiasts alike. 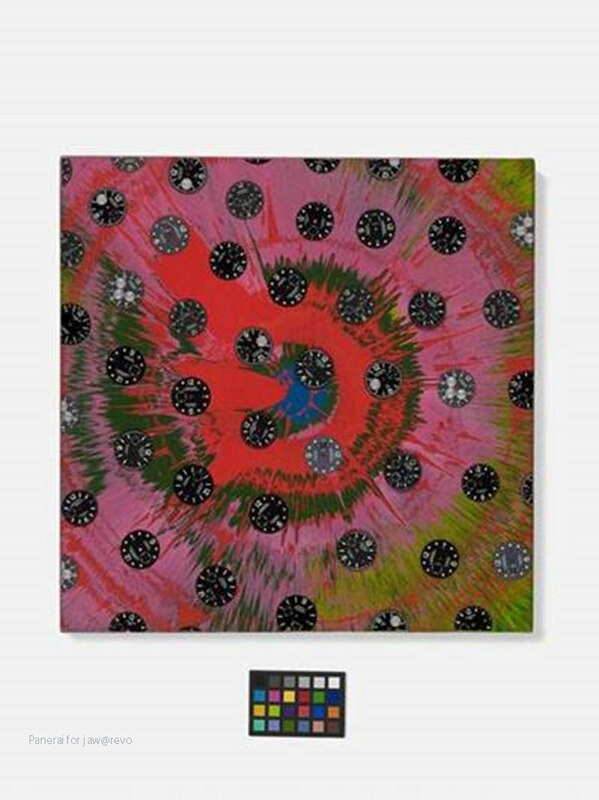 Damien Hirst Beautiful Fraction painting. Note the multiple Panerai watch dials within the masterpieces. 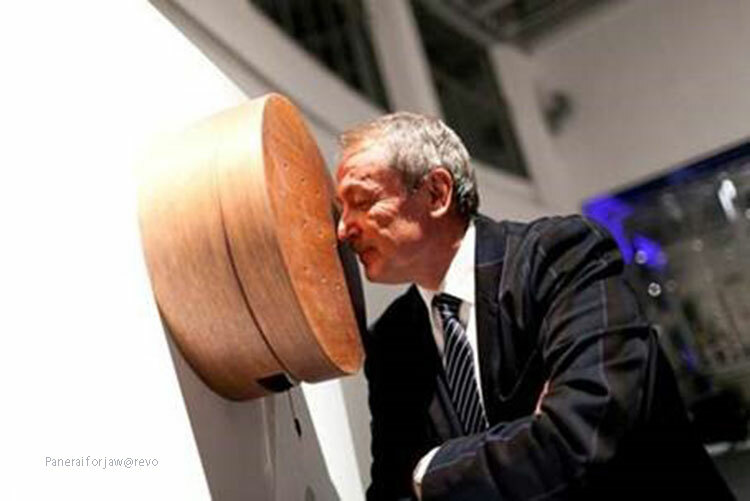 “We are here for a good time, not a long time” Damien Hirst. 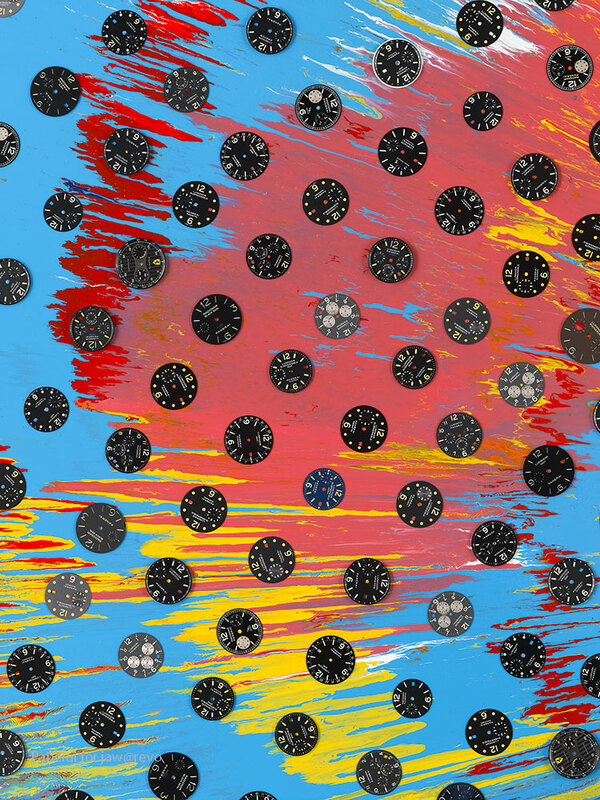 Two spin paintings made by assembling dozens of circular faces from Officine Panerai watches, all strictly without hands, within the rotating surface. Time is reduced to its circular quintessence, to its perpetual and unmeasurable motion. The absence of hands like the death of Kronos and the triumph of Kairos. 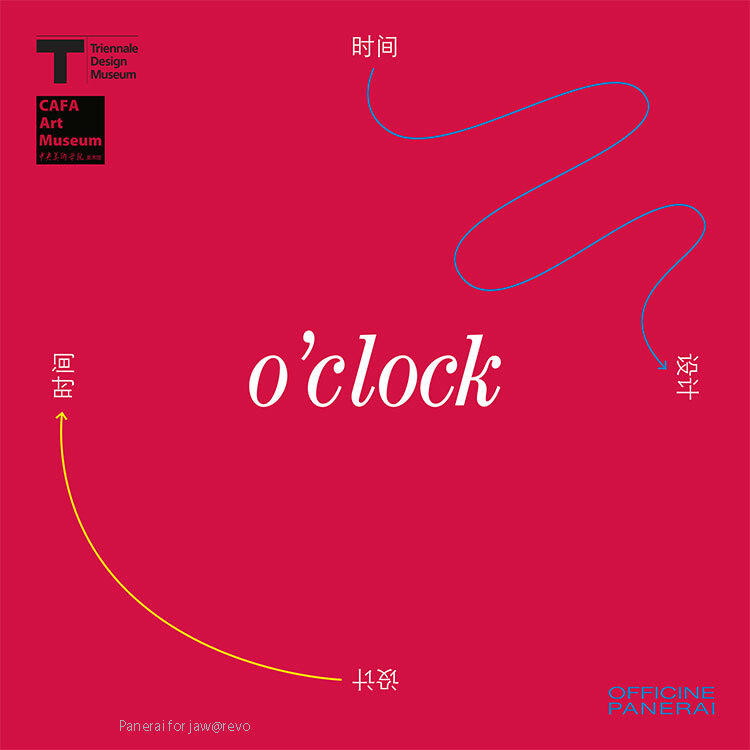 Encouraged by the highly acclaimed show by Triennale Design Museum in Milan at a time when Officine Panerai is enjoying great commercial success in China, the exhibition “seek to answer questions such as: “How is time measured?”, “How can passing time be shown?” and “How can time be experienced?”. 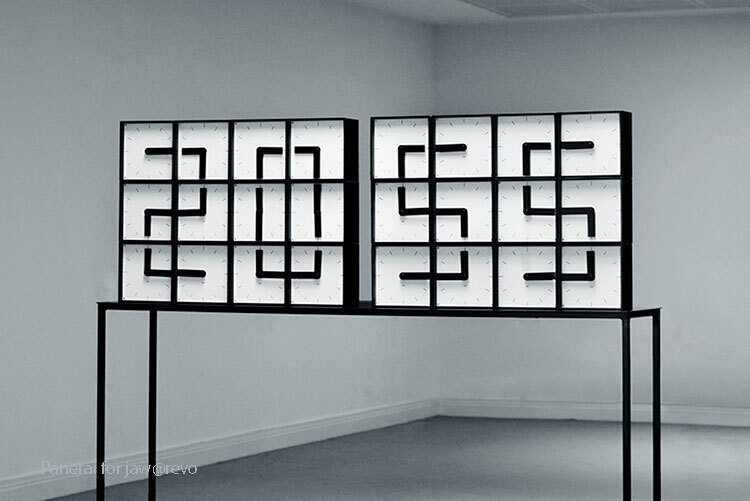 All the works exhibited tackle subjects such as the passage of time, time’s evolution, and decay over time, in ways that are sometimes ironic, sometimes poetic, sometimes meditative and sometimes critical” says Triennale Design Museum. Human since 1982 The Clock Clock. Time-measuring instruments are generally conceived of for sight and sound. 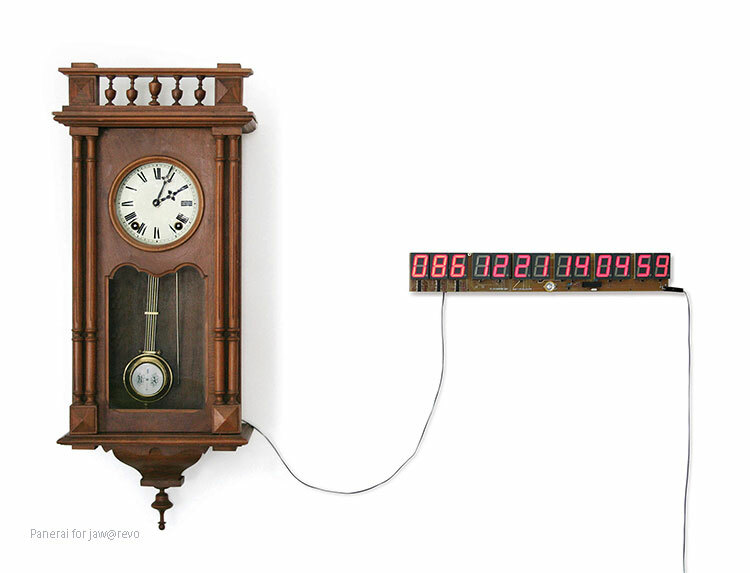 The passing of time through the hands of a clock is perceived by the eyes; sometimes we know time is passing because of the ticking of a chronometer or the sound of a bell. Scented Time instead involves the sense of smell and measures time through a succession of scents and fragrances. 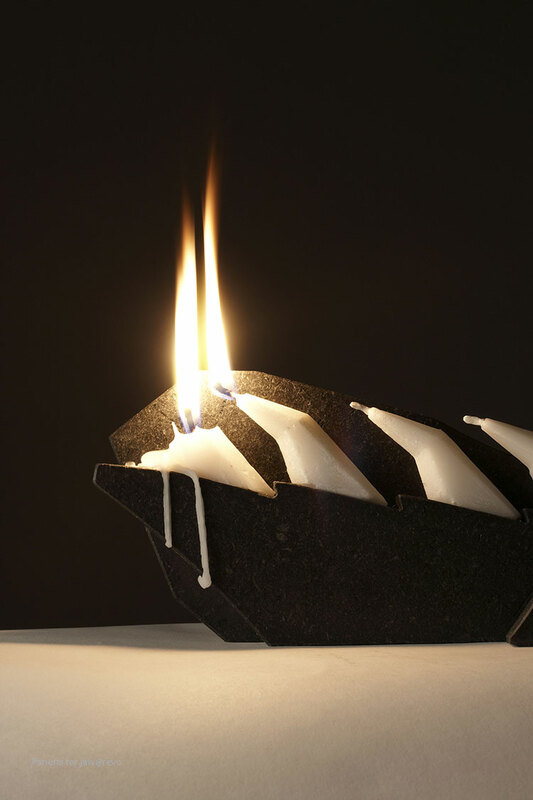 Specially conceived for people who can’t see, Scented Time is made up of seven perfumed candles and by a lava stone candle-holder. Each candle emits a different scent, which lasts 20 minutes, but before going out it passes its flame on to the next candle. Depending on the scent in the room the user can figure out how much time has passed from the moment when the first candle was lit. Measuring time becomes much like a ritual which anyone can decide when to begin, by using the oldest of our sense organs. 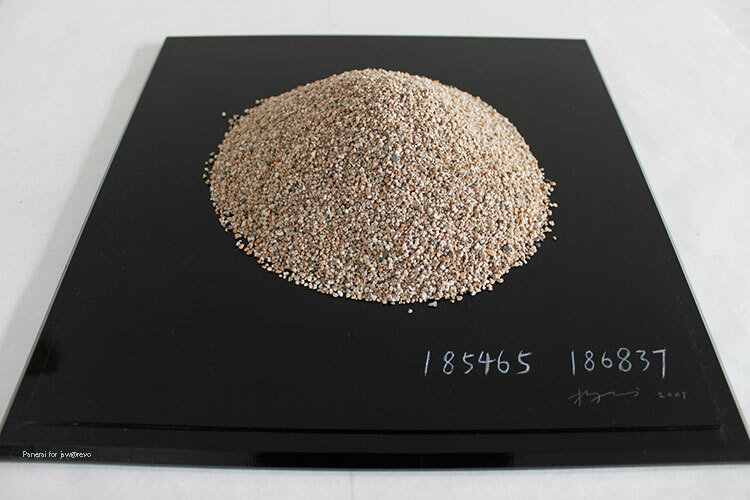 Certainly, it is also a clear demonstration the paramount importance of China as a market for both haute horlogerie timepieces and fine art masterpieces. How to spend time: the days pass slowly, almost imperceptibly, relentlessly. Each and every day, one after the other. What happens when they have passed? What meaning does what has passed have? What’s the value of the past? The Chrono-Shredder turns dealing with passing time into an art form. 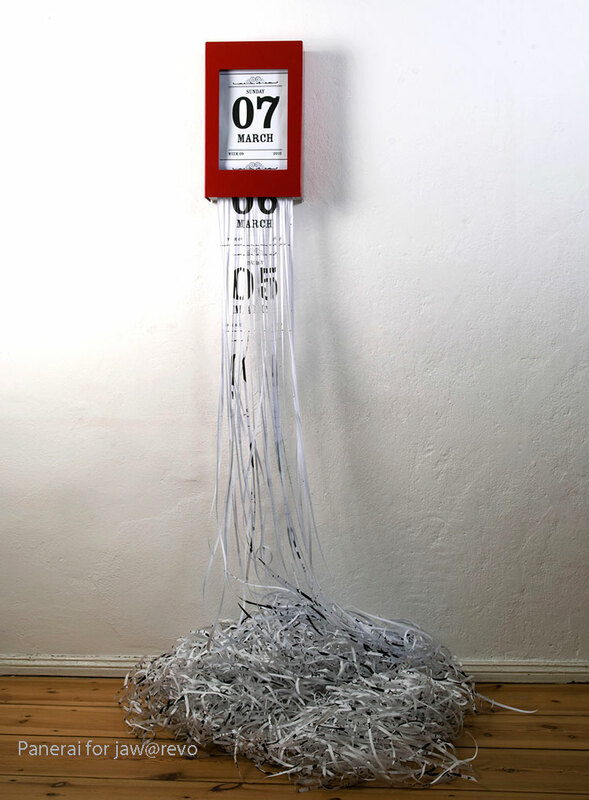 The days of the year are represented on the parts of a single roll of paper; each day that goes by is placed in a paper shredder to be cut up into tiny pieces, destroyed, eliminated. The past, as such, is the past and is no longer has any value. Traditionally, Chinese fine watch buyers are interested mostly in elegant and classic timepieces, and no sport watch brand other than Officine Panerai has been able to penetrate the market in a meaningful way. A Hong Kong retailer I spoke to claimed that Panerai is in fact, the single strongest sport watch brand in China. For sure in a near future we will be all nourished with some kind of pills. This will happen, not because we are pleased about, but because all our natural resources will be contaminated. It is in theory possible to live with such a functional diet, but the body is still contrary to these radical changes, it needs generations to evolve to a new form and format. This will happen also, but in a very far away future. In Time to Eat wall clock eating times are evidenced by cooking smell. This smell still acting as activator from our senses and our chemical substances related to memory and feelings. Time to Eat is a kind of transition to adapt our body to a radical change. Next generations will not need Time to Eat anymore. For this work, it took a lot of time to count the mound of sand twice. Since it is easy to lose focus and be distracted during the counting process, the artist got two different numbers in the end. An attempt to discover what is “real” through a process that is highly reliant on self-discipline. And that is truly an impressive achievement.